Myth or fact the Angels of Mons makes an interesting story. In August of 1914 things weren't going too well for British troops as they fought the Germans near to the village of Mons in France during World War I. The greater numbers of the German forces began to overwhelm the British soldiers and they had no alternative but to retreat. However all was not lost as winged and robed angels appeared between the opposing armies causing the Germans to fall into disarray. As far fetched as this will seem to many lots of the British troops who served at Mons insist that they saw the angels who came to their rescue. 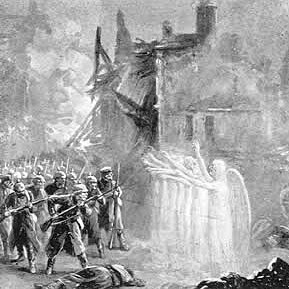 In 1915 a Private Robert Cleaver of the 1st Cheshire regiment swore an affidavit of what he had witnessed: "I personally was at Mons and saw the vision of the angels with my own eyes." An unnamed lance-corporal is quoted as saying, "I could see quite plainly in mid-air a strange light which seemed to be quite distinctly outlined and was not a reflection of the moon, nor were there any clouds in the neighbourhood. The light became brighter and I could see quite distinctly three shapes, one in the centre having what looked like outspread wings, the other two were not so large, but were quite plainly distinct from the centre one. They appeared to have a long loose-hanging garment of a golden tint they were above the German line facing us." General John Charteris also wrote to his family of how, "The angel of the Lord on the traditional white horse, clad all in white with a flaming sword, faced the Germans and forbade their progress." What really happened that day becomes muddied by author Arthur Machen and his short story called The Bowmen, which was published also in 1914 in the London Evening News newspaper. Machen's story told of how phantom bowmen from the Battle of Agincourt (which is near Mons), were summoned by a soldier calling on Saint George, and these bowmen saved struggling British soldiers from the Germans. Though Machin's story was fiction, and the actual battle near Mons is fact, controversy has followed that the Angels of Mons story was based on The Bowmen and was built on as propaganda by the British. There is a dispute as to what was written first: The Bowman or the letter mentioned from General John Charteris. Even today the debate carries on as to whether the Angels of Mons are fact or fiction. Were those soldiers helped by angels or was it propaganda, mass hallucination or something else? "The battle of Mons was a small affair by later standards, no bigger than some of the engagements in the Boer War. Still, it was the first British battle; and also the only one where supernatural intervention was observed, more or less reliably, on the British side. Indeed the 'Angels of Mons' were the only recognition of the war vouchsafed by the Higher Powers." Interesting! Angels seems to come in all shapes and sizes and in many different kinds of circumstances. While this is a lovely story, unfortunately it's a myth. Arthur Machen was a popular writer of the time who wrote a short story about phantom bowmen from Agincourt being sent by St George to protect the soldiers at Mons. This story was taken as fact by many people, took on many forms and variations and, as happens often, became an urban legend. The "Angels of Mons" variant of the story is merely the mist popular one that has survived to this day.